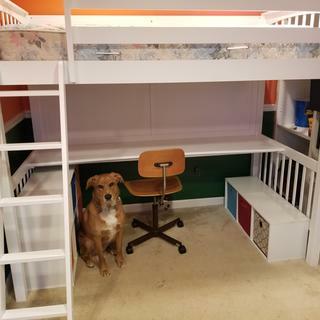 L: 79.5" x W: 68" x H: 70.5"
Jordan Twin Loft Bed w/ Desk If you're looking to outfit your kids' bedroom with gorgeous modern furniture, the Jordan twin loft bed is the right choice. The slatted headboards design is simple and tasteful, making the aesthetic of this loft bed truly timeless. Plus, this bed features a desk under it to add functionality and save space! If you're looking to outfit your kids' bedroom with gorgeous modern furniture, the Jordan twin loft bed is the right choice. The slatted headboards design is simple and tasteful, making the aesthetic of this loft bed truly timeless. Plus, this bed features a desk under it to add functionality and save space! L: 79.5" x W: 68" x H: 70.5" Weight: 181 lbs. Frame joints are reinforced with dowels screws and glue for added strength and stability. Worth the work you put in. Very sturdy and not too complicated. Fantastic look! I would definitely recommend this for any small space that you are trying to get the most out of. We have struggled for our son to sleep in his own bed for years until this past Tuesday. The Jordan Twin Loft Bed w/ Desk came and my son has slept in it soundly every night since. Simple design left enough room to put storage cubes under each side and sturdy enough to hold a 300 pound parent who needed to fix a light fixture. Even the dog loved it! Seems well built and sturdy. I got it in the white and I'm very pleased. Desk is nice a big. 5 stars for sure. I also brought the 5 drawer dresser and can't wait till it comes. My daughter loves her bed and desk. Good quality, looks adorable in my daughters room. Delivered quickly with set up. delivery guys were great! on time and easy set up. Great sturdy product! Perfect for our 11 year old daughters room. Can it be built without the desk? BEST ANSWER: The desk needs to be attached to properly secure the bed. It will be a safety concern if the desk isn’t attached. does this bed fit a 10inch mattress? BEST ANSWER: Hello Steve, a 10" mattress would be too thick to the Jordan Twin Loft Bed w/ desk. We recommend a mattress no thicker than 7" or 8"
can the ladder be set up on the right side of the bed? BEST ANSWER: The ladder cannot be moved to the right side of the bed. Looking for clarity. I get that you cannot move the ladder once it is set up. But can the unit be assembled with the opening on the right side or only for the left side? Hello Russ, the ladder can only be installed on the left side as shown in the images. I'm five foot ten, will i be be able to fit? BEST ANSWER: My 6ft grandson has slept in the bed and said he was fine. What is the height of the desk from the floor? I want to place a small dresser under 1 side for craft storage. BEST ANSWER: Hello Susan, thank you for your interest in the Jordan Twin Loft Bed w/ Desk! The height from the floor to the bottom of the desk is 26 1/4"
if the Bed is a twin why does the width 68 inches? is this correct? BEST ANSWER: Hello Arthur, thank you for your interest in the Jordan Twin Loft Bed w/ Desk! The width of the twin bed is 42.5". The full width, 68" measurement includes the ladder. What type of twin mattress best fits the Jordan twin loft bed with desk? BEST ANSWER: A low height twin mattress, such as 7" or 8" would be recommended for the top bunk. can the loft bed convert to a stand alone twin bed? BEST ANSWER: The Loft can not be converted into a bunk bed. The Jordan collection does offer a twin over twin bunk bed as an option under another SKU, such as 599131035. Can this be converted to a bunk bed as well? BEST ANSWER: The Loft can not be converted into a bunk bed unfortunately. The Jordan collection does offer a twin over twin bunk bed as an option under another SKU.